Had a nice training ride today. 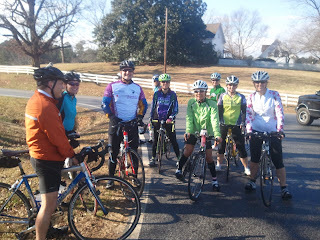 Showed up to find a big group of folks that wanted to show up for such a gorgeous day in January. Some were getting in their first ride since Ironman Arizona! Also got to hang with Sasha, one of my favorite training partners from the past couple of tri seasons. Easy 40 miles and despite the wet roads that kept reminding us that it must have just rained before we got there, we never got rained on. Fantastic because I really hate to ride in the rain. Blood sugar was mostly in check though I did go low within the last 5 miles of the ride. I have to remind myself to just keep on sucking in the sugar even if it's an easy ride and I'm almost done. Had a couple of slight mechanical issues with my saddle and handlebars (yikes!) coming loose. Fortunately had Sasha and Sarah around to stick with me while I worked those issues out. Looks as if my last re-fit didn't quite torque those bolts down enough. Oops. I wish all training rides were this easy and fun! I know this weather won't hold up so I better relish it while it's here.